Without Walls acknowledges the complex connections between the changes in the world’s climate and the subsequent environmental and social challenges that many people across the world are facing. Without Walls recognises its responsibility in reducing its carbon and environmental footprints in order to play a full role in tackling these challenges. Environmental themes have influenced a proportion of the consortium’s artistic output since its inception 10 years ago – with a range of commissions large and small, from the spectacle of Wired Aerial Theatre’s As The World Tipped (2011) to the intimacy of Cocoloco’s walkabout show Willy and Wally (2017) – created by artists and presented by festivals across the UK and the world beyond with a keen awareness of its environmental impacts. The Without Walls Business Plan for 2018-22 outlines six Aims in support of this Vision and Mission, these aims in turn supported by a number of objectives, several of which directly support the consortium’s commitment to environmental sustainability. Without Walls’ Board of Directors, supported by the XTRAX management team, leads on the consortium’s commitment to environmental sustainability, ensuring it is fundamentally embedded in the governance and management of the consortium’s work. The setting and reporting against targets in support of this work programme sits centrally, led by XTRAX and outlined in full in and Environmental Action Plan. A broader approach to environmental sustainability sits at an individual festival level across the consortium, with a number of its festivals leading the outdoor arts sector and taking significant steps to explore and implement a range of ideas to reduce their respective carbon footprints. Each of the consortium’s festivals has its own established policies, plans and broader approaches to environmental sustainability and as such, with its consortium model, Without Walls operates in a different way to many other NPOs (including its individual partner festivals). Besides reporting on the environmental impact of its centralised management function, from energy consumption to travel arrangements, the Board has identified the greatest value in allowing its members to continue to report of their impacts individually, then sharing best practice across its membership and focussing particular attention on members who are less experienced in order to facilitate broad improvements across the full breadth of the consortium. Additionally, the consortium will work alongside industry experts and others in the Outdoor Arts sector (including Julie’s Bicycle, ISAN and NASA) to take a sector lead, ensuring that its Policy and the Environmental Action Plan are developed and refreshed, using the learning from a Creative Crane project that explores the creation and touring of low carbon work to feed this development, and identifying ways of improving environmental good practice in the sector, sharing this knowledge through the consortium’s Learning Network and with the wider Outdoor Arts sector beyond. Without Walls is committed to understanding, measuring, improving and communicating its environmental performance. 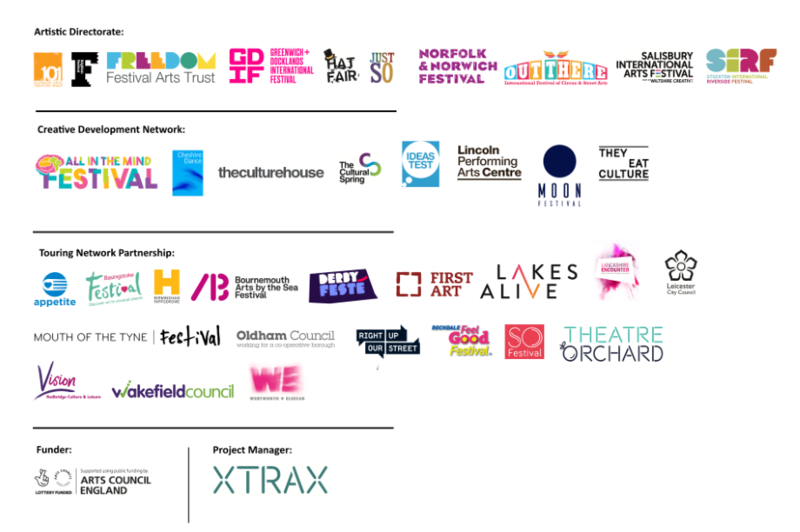 Demonstrating the importance the consortium affords this responsibility, this commitment is strengthened as Without Walls takes on a sector-leading role in joining the Arts Council England National Portfolio. Without Walls observes existing environmental legislation as a minimum standard and will seek to out-perform current legislative requirements where practical. Without Walls is committed to reducing the negative environmental impacts of its core activities as managed by XTRAX. XTRAX is one of a number of companies housed in an ethical/cultural co-operative workspace, the Work For Change Co-operative building in Hulme, Manchester. Built in 1996, environmental design was a priority from the start, resulting in a building that benefits from super insulation, efficient heating provided by a sustainable wood chip boiler, low E glass, low energy light bulbs, grass roofs, ethically-sourced and low-carbon paint, and recycling points. A range of environmental targets for the building are constantly monitored, including the reduction of CO2 emissions and heating bills and the increasing of recycled waste. Currently, the Co-operative is investigating installing solar panels and a biomass boiler to further reduce carbon emissions. Ethical Consumer magazine is based in the building, and offers advice on suppliers and contractors to other resident companies. Whilst acknowledging the limitations in controlling every aspect of its local environment, XTRAX will stay abreast of an developments planned for its office accommodation, in order to fully input into any planned improvements to best support the continuous improvement embedded within this Policy. Day-to-day, XTRAX will continue to embrace good practices in energy-saving (switching off hardware at the end of each working day, including standby modes etc) and the management and reduction of waste materials (recycling procedures, internal printing protocols to reduce paper and ink consumption, and the prioritisation of digital over paper-based working wherever possible etc), embedding this working ethos in its induction procedures for new staff. As a national project with 18 partners, travel by both the management team and the consortium’s festival partners is always going to be a major consideration, representing by far the biggest carbon impact of the consortium’s management. XTRAX will develop and maintain a sustainable transport policy for its staff, seeking to reduce unnecessary travel and making the transport that is necessary as sustainable as possible. It is acknowledged that reducing environmental impact may sometimes lead to greater costs, a striking the right balance will need to be assessed on a case-by-case basis. Progress will be monitoring annually at a Board meeting in the context of the consortium’s wider environmental performance. Flexibility in working hours and the timing of meetings, events and activities will be considered in order to best support the sustainable transport policy. Particular focus will be given to exploring how digital resources can further reduce the need for physical meetings and the travel they entail. Whilst we already regularly use conference calls (currently pow wow) and video conferencing (currently skype) for meetings, we recognise a clear need to research, trial and invest in new technologies as they develop in order to increase the effectiveness of working in alternative ways. The consortium’s digital strategy outlines an investment in equipment that will aid digital distribution, webinar-based training, live broadcast etc. Working in partnership with a wide range of organisations, XTRAX and Without Walls will seek out partners who actively champion environmental good practice in all their activities and service provision. XTRAX will select venues for its external events (including training sessions, launches and meetings) that can demonstrate environmental policies that complement the consortium’s approach. XTRAX will also select suppliers (eg designers, printers, caterers, equipment suppliers etc) that are local to its offices, where appropriate, to reduce travel time/energy use. If any service is contracted out to another organisation as part of the delivery of Without Walls’ activities, the organisation will be required to demonstrate that it has its own environmental policy or to agree to act in accordance with the consortium’s own policy. Training will be offered whenever relevant and feasible to XTRAX staff members in environmental issues. Staff members with a particular interest in or expertise and experience of environmental issues, practices and policies will be encouraged and enabled to share these connections through both informal and formal training opportunities with other staff members. If a staff member undertakes relevant training externally, s/he will be asked to share this training (if appropriate) with other members of staff in order to enable all staff to benefit from it, particularly if it is not financially possible for all staff members to attend. All staff members will have access to a copy of the Environmental Policy, and to use it to guide their contribution to the work of the consortium. a range of indoor events planned across each year – reporting specifically on business travel and waste & recycling. All staff are made aware of this policy and their responsibilities for environmental issues. Without Walls is committed to working with its Board and its management team to ensure we consider and communicate the environmental impact of our activities. XTRAX will publish Without Walls’ Environmental Policy on the consortium’s website, alongside additional reports what demonstrate progress made and support in general the progress made by the outdoor arts sector. Responsibility for implementing and monitoring this Environmental Policy lies ultimately with the Without Walls Board of Directors, with delegated responsibility given to the XTRAX management team in its implementation in the day-to-day running of the consortium. The Board of Directors identifies one of its members as the consortium’s Environmental Champion to take on the oversight of this Policy and the Environmental Action Plan, and all related issues. XTRAX undertakes to monitor the implementation and effectiveness of its Environmental Policy and the Environmental Action Plan on an ongoing basis in order to improve Without Walls’ environmental performance over time. Both policy and plan will be reviewed on an annual basis by the Board of Directors in conjunction with the XTRAX management team as appropriate.